On An Overgrown Path: Why is Messiaen suddenly so popular? Why is Messiaen suddenly so popular? 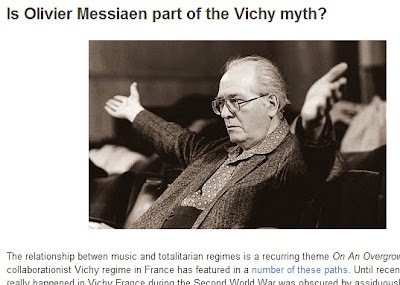 There has been a large spike in traffic to my 2012 post Is Olivier Messiaen part of the Vichy myth? seen above. Traffic logs show the traffic as coming from Facebook, but do not identify the exact source. As this is a mildly controversial topic with topical resonances I would be grateful for any information from readers about links to this post. Contact me via a comment or the email address in the sidebar. Thanks. Both Alfred Cortot and Jacques Thibaud served in posts in the Vichy Regime. I have thought in the past that there must have been some fundamental difference in the castes of mind of these two, this thought coming to me as I puzzled over why Casals, who famously performed trios with both in pre-war years, forgave Casals but resolutely refused to forgive Thibaud. There is a puzzle there, but one on which I can myself only speculate as I've never come across any clues. But when it comes to castes of mind, I've never been very convinced by the 'lived in a world of his own...oblivious...not interested in politics' argument in the context of Nazi-occupied Europe. Messiaen must have known that there were so many vacant positions up for grabs in the universities and the conservatoires because the professors who had sat in those chairs were Jews, dismissed from their posts and most likely en route to Auschwitz. If he didn't know that, he must have been a solipsist, for others did and refused for that reason to accept those vacant positions when offered to them. May I add that I can't accept this accusation against Webern. He taught only privately and never more than eight pupils. Five of his pupils between 1931 and 1938 were Jewish. By late 1936, the only pupil left was Emil Spira, a Polish Jew and my own teacher. He did not flee until the day after Kristallnacht. His last two years in Vienna he lived with Webern and his family, and he had a portrait of Webern on the wall of his music room. Once in London, Spira was taken up by Kandinsky, who asked Schoenberg to take him as a pupil. I find the accusation against Webern ludicrous and that made by an earlier commenter against Schoenberg not even worthy of a rebuttal. Your question on Messiaen’s activities during the Occupation seems to have been answered in the volume: CHIMÈNES, Myriam, SIMON, Yannick “La musique à Paris sous l’Occupation” Fayard, where there is a chapter called: BALMER, Yves, BRENT MURRAY, Christopher “Olivier Messaien et la reconstruction de sa carrière sous l’Occupation. Le vide de l’année 1941. The book is published (in electronic form as well) by Fayard, one of the leading music publishing in France, so the issue is now hardly unknown to the scholars and music-loving public. I am not uninterested in the confluence of music and politics and have no sympathy for the politics of the Vichy regime. The remaining question for the scholars is if his taking over the harmony chair at the Conservatoire had at the time any significance or rather if by that time the later evolution of Messiaen could be guessed (it has become very common in the studies to decry in hindsight the fact that Tony Aubin kept the composition chair in the Conservatory).